Would you like to be a phenomenal rugby player? Want a quick and easy way to increase your skills from within? Rugby players need superior ball handling skills. They need to know their way around the field, passing and throwing when the opportunity arises, playing offensively or defensively as the situation demands with equal zest and passion. With the Improve Your Rugby Game subliminal session, you'll set your natural sporting genius on fire! As you listen, thousands of powerful positive affirmations will infuse your mind, helping you play at your very best. You'll play instinctively, knowing exactly what to do and when to do it to move your team forward. You'll set up plays that gain your team yardage, putting them in the perfect position to score tries and field goals. 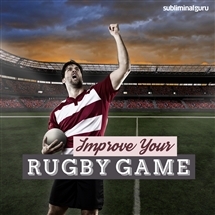 Download the Improve Your Rugby Game subliminal audio now to enjoy the outrageous rugby abilities you've always wanted. I am a brilliant rugby player. I'm an important member of the rugby team. I practice my rugby skills diligently. I throw and pass with accuracy. My rugby skills get better every day. I am a rugby superstar.